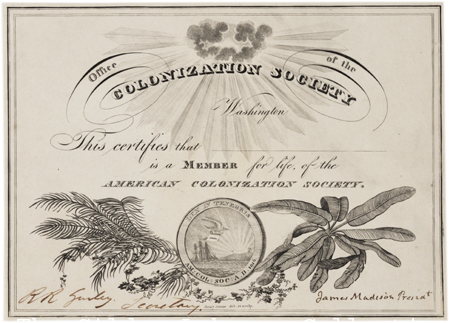 When James Madison signed this membership certificate as president of the American Colonization Society in 1833, the organization’s effort to repatriate America’s free black population to Africa had been underway for over a decade. On December 21, 1816, Robert Finley, a Presbyterian minister from New Jersey, initiated the founding of the society. He laid out his goal of establishing an African colony at a meeting of powerful white supporters, including Henry Clay and Francis Scott Key. The membership rolls expanded rapidly and in the following years the society’s base in Washington, DC, extended to auxiliary organizations throughout the country. 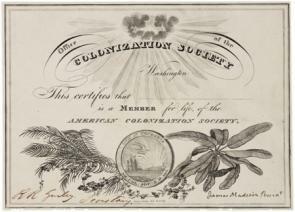 Concern over the growing population of free African Americans attracted individuals from seemingly disparate groups to the American Colonization Society. They included both abolitionists and slaveholders. Abolitionist members sought the gradual elimination of slavery and wanted to provide free blacks with the opportunity to escape racism and the systematic denial of citizenship rights in the United States. Slaveholders saw a threat to their livelihood in the growing free black population and believed African colonization would help reinforce the institution of slavery at home. Linking both groups was an entrenched belief that whites and blacks could not coexist equally in the United States. 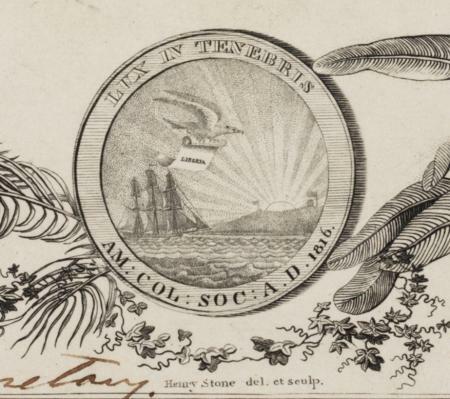 Congress granted the society $100,000 in 1819 and provided its first ship the following year. By 1822, the society succeeded in establishing the colony of Liberia on the west coast of Africa. By 1867, more than 13,000 African Americans had emigrated. The American Colonization Society continued doing missionary and educational work in Liberia until its dissolution in 1913. Read the document introduction, look at the document, and apply your knowledge of American history in order to answer the following questions. Why did abolitionists in the early years of the nineteenth century accept colonization as a possible solution to the issue of American slavery? Study the image within the circle on the certificate. Explain how the drawing supports the Latin phrase, “Lux in Tenebris” (Light to Darkness). Comment on the validity of the following statement: The plan to colonize Liberia with former slaves from America was doomed to failure.